Google Minus Google is a modified version of the famed Google search engine that does not return any results from web sites owned by Google, such as Knol, Blogger and YouTube. It’s almost as if Google never existed, bringing a breath of fresh air into your searches. 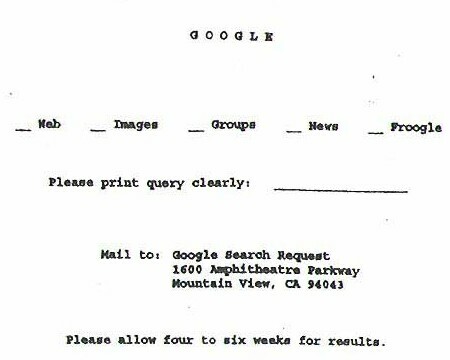 If Google existed in the 1960’s. Found on Fury.com and Boomerang. Is Googling wrecking the environment? This is a interesting blog article that gives some food for thought. According to a British newspaper, we’re pumping carbon dioxide into the air with each query on Google. The blog article does dispute this claim, citing Google’s efforts to reduce its impact on the environment. I can only draw one conclusion from all this. As the Internet continues to grow, it must pay close attention to what it’s doing to our planet in the meantime. 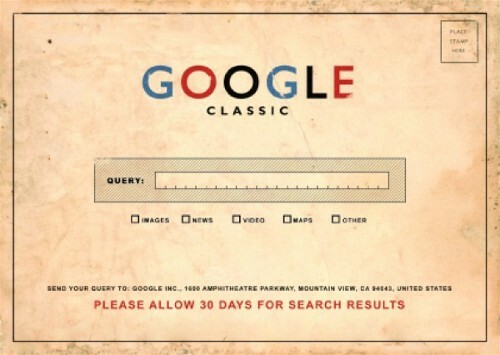 As part of its 10th anniversary festivities, Google is pulling out its oldest search index and making it available for searching so you can see what the web was like back in 2001. I found it interesting and quite nostalgic. Jumping off the Google bandwagon. I really found this article interesting. At first glance, Google sounds like a great place to work. Maybe it still is, but it now looks like there are reasons not to want to work there, as told by Google’s ex-employees. The dangerous side of boredom. I must’ve been really bored at work today because I found myself going to Google to play with its language tools. I like to type in a sentence in English, translate it to another language and re-translate it back to English. The resulting re-translations are often more interesting than what I started with. The following nursery rhymes were translated to Japanese and then re-translated back to English. See if you can recognize them. The lamb going, was secure. The dry dock of Dickory of hickory! The mouse moved on the clock! And it is called that the macaroni. Explosion sound! The weasel goes. Implementing its “if you can’t beat ’em, buy ’em” strategy, Microsoft has acquired Google and has redone the popular search engine to its liking. It will take some time to adjust to Google’s new look, especially when you have to do searches by product ID numbers. I don’t know about you, but I liked things the way they were before.